Major High Wind - Blowing Dust - Extremely Critically Dangerous Fire Weather Event Wednesday! Blog Updated At 12:30 AM MDT Wednesday, April 10th, 2019. 2:55 PM MDT Tuesday, April 9th, 2019. Altocumulus Standing Lenticular Clouds (ACSL) Northeast Of Carlsbad, New Mexico. 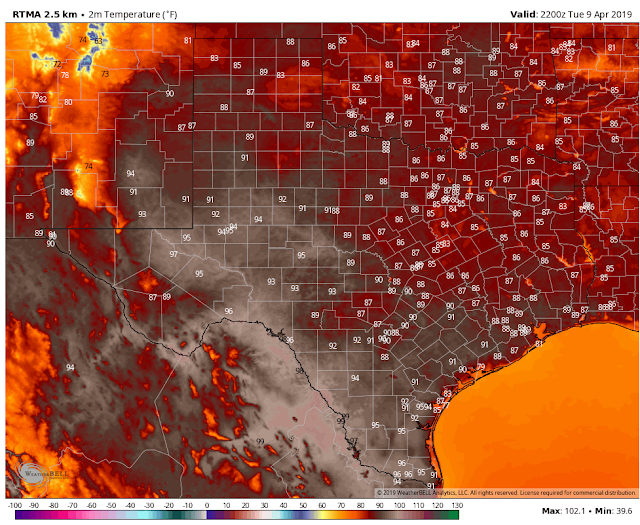 RTMA Temperatures At 4 PM MDT Tuesday. Reported High Temperatures As Of 4 PM MDT Tuesday, April 9th, 2019. 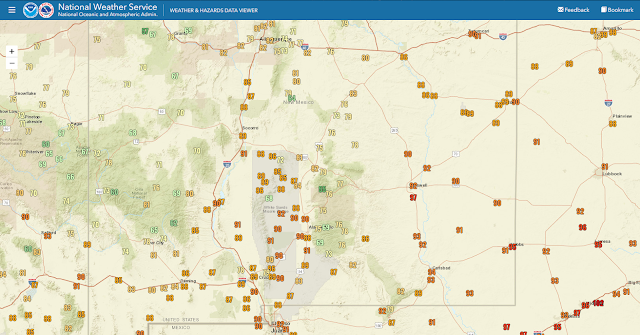 Wow...as of 4 PM MDT the Roswell Airport ASOS had managed to climb up to at least 97ºF this afternoon! 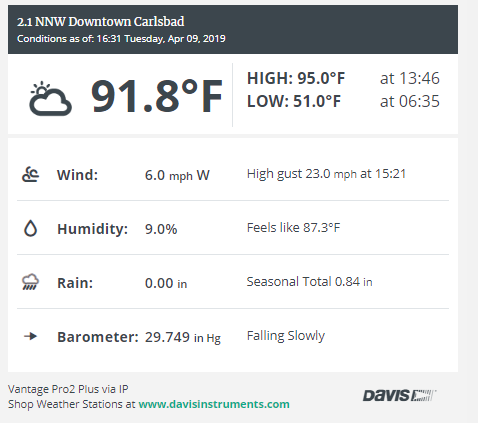 Meanwhile my Davis Vantage Pro2+ Personal Weather Station located in my backyard in northwestern Carlsbad came close with a high of 95ºF. Ugly April 10th Weather Still On Track. 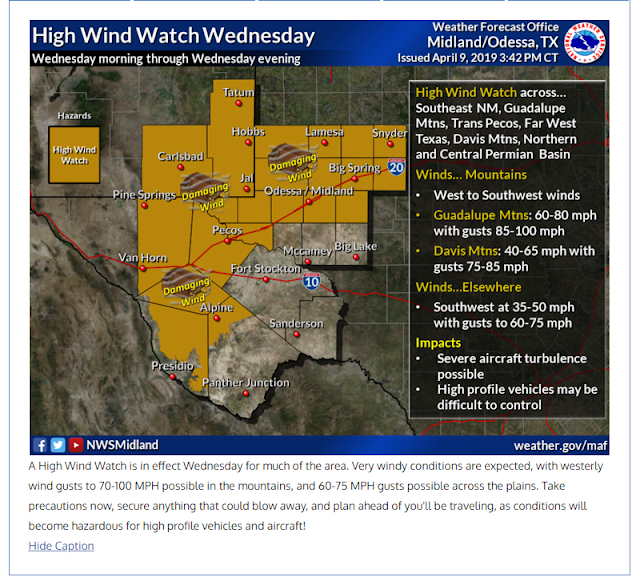 Courtesy Of The Santa Teresa/El Paso National Weather Service Office. 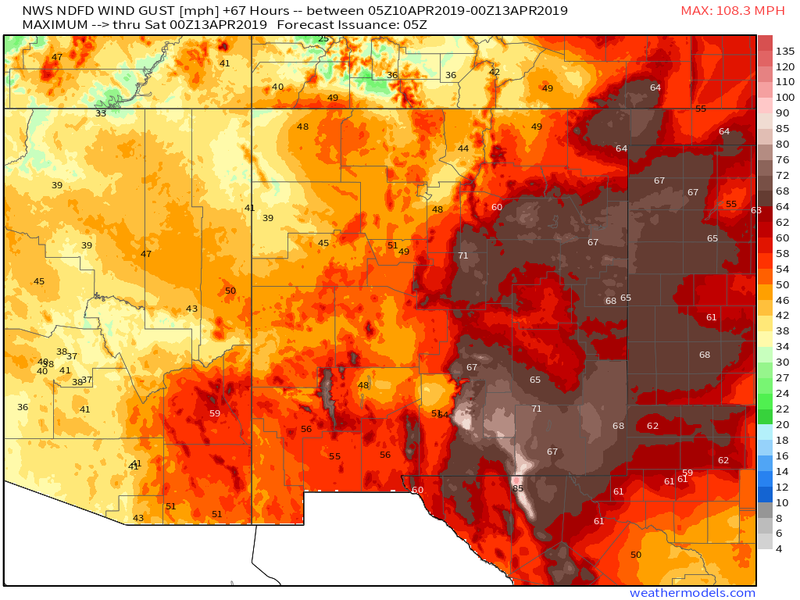 NWS NDFD Forecast Peak Wind Gusts Wednesday. Note The Peak Gust Of 108 MPH Forecast For The Guadalupe Pass Area. 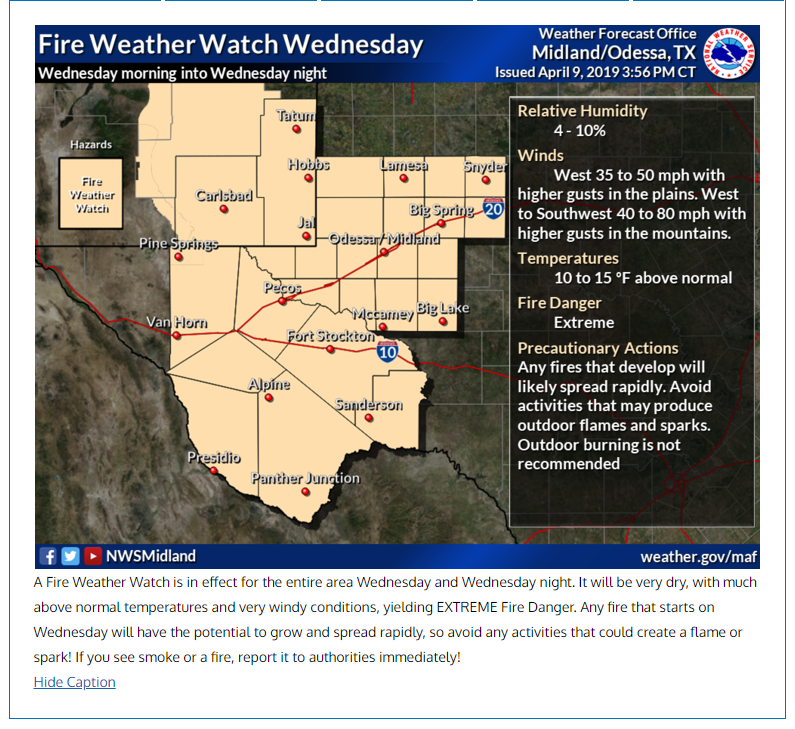 Major Widespread High Wind/Blowing Dust/Extreme Fire Danger Event Anticipated Wednesday! High Wind Watches And Warnings Continue In Effect Locally! 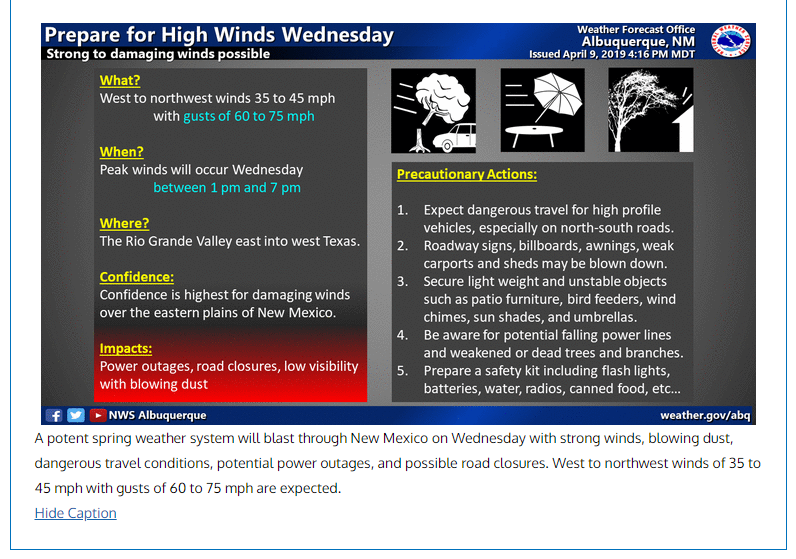 Southwest to westerly winds will increase to sustained speeds of 60 to 80 mph with gusts near 100 mph Wednesday! Southwesterly winds will become sustained at 35 to 50 mph with gusts around 60 to 75 mph Wednesday! Southwesterly winds will become sustained at 40 to 50 mph with gusts near 60 t0 75 mph Wednesday! Southwesterly winds will become sustained at 40 to 55 mph with gusts near 60 to 75 mph Wednesday! Southwest to westerly winds will become sustained at 40 to 45 mph with gusts near 60 to 70 mph Wednesday! Widespread Blowing Dust May Hamper Travel! Blowing dust will likely become widespread in the afternoon with the visibility dropping below 3 miles across the area. Travel upon local highways and roadways may be impacted in some locations due to the widespread blowing dust. During the higher southwesterly to westerly wind gusts there may be sudden drops in the visibility down to near zero with little to no advanced warning in some locations. This will be especially true over and near orchards with exposed bare ground, freshly plowed or open farmlands, fields, and construction sites. Remember these areas pose a high danger to anyone traveling through them should they encounter these blinding clouds of dust. The area has a history of multiple vehicle accidents with injuries and fatalities during these major high wind and blowing dust events. Multi-vehicle pileups have occurred several times in the past twenty years during our more high end high wind and blowing dust events. 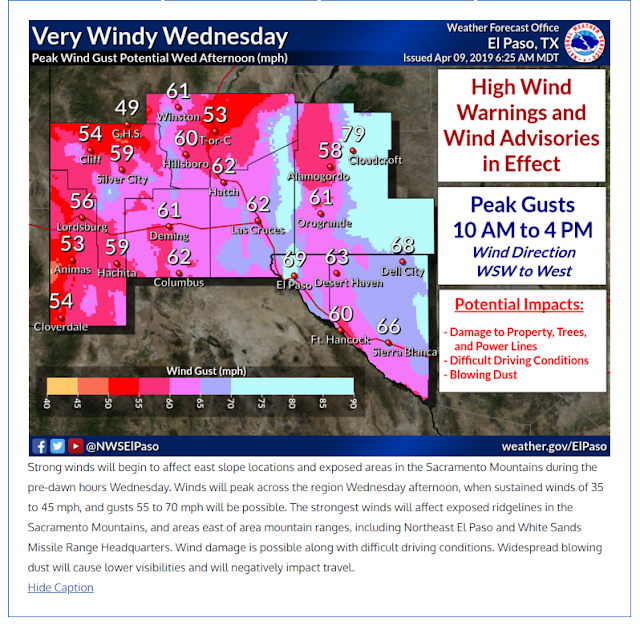 High winds may also pose travel problems on some of our local highways with the possibility of some of them becoming closed due to the high winds and blowing dust. Some structural damage may occur during the higher gusts. This includes power lines and other utility lines being blown down. Power poles and other utility poles being blown down. Some roof damage including shingle damage may occur. Small sheds and outbuildings could be blown down. Some high profile vehicles could be blown over of off local highways. Some west facing buildings may have their windows blown out. Agricultural irrigation sprinkler systems could be blown over even when filled with water during the more severe gusts. Extremely Critically Dangerous Fire Weather Conditions Wednesday! This means that any wild fire, range fire, forest fire, or grass fires that break out Wednesday will have the potential be long lived and may rapidly spread and grow and will be extremely difficult to control or put out. Blinding clouds of smoke could possibly combine with the blowing dust and drop the visibility on some local roadways to zero should a fire break out near a road or highway. Any outdoor activity that may involve the use or create sparks or flames is not recommended on Wednesday. Our local area has a history of destructive wild fires that have burned thousands of acres of grasslands and forest lands. Homes and other properties have been lost on multiple occasions and tragically even some lives. Livestock and wildlife unable to outrun the fires have also been lost. The potential for rapidly developing, long lived, life threatening wildfires is extremely high on Wednesday!